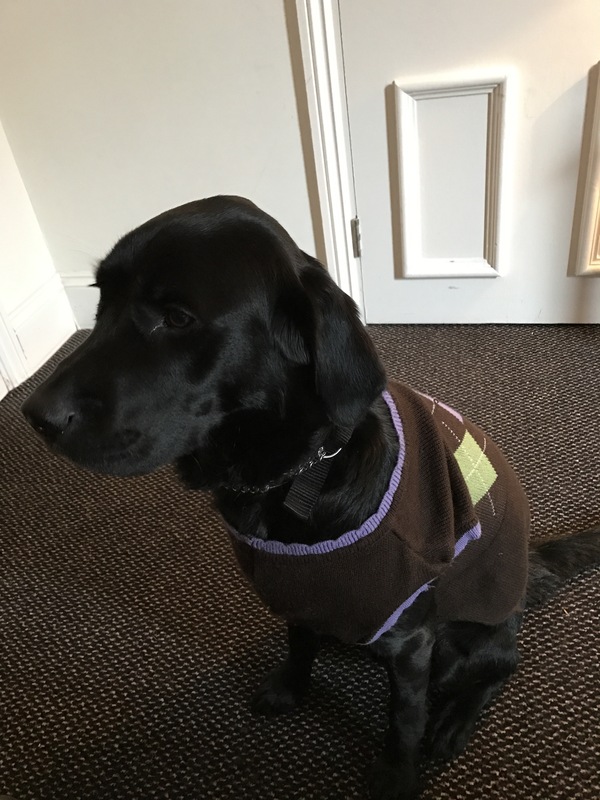 Obi Personal Log Aged one year and ten twelfths: Does anyone know the guide dog rescue number? Let’s be clear. There are some things advanced guide dog training covers and some it does not. I have issues. I’m not sure I’ve been issued with the correct equipment for this assignment. This place is In the country. I mean like, real country. There’s mud in the garden. Where are my wellingtons? The garden has fields round it. The fields, as of yesterday, have cattle in them. They not only come up to the fence and stare at me, but they point their bottoms at me – one pushed his AGAINST the fence. Fat Dog on Wheels thinks they’re lovely. I nearly died. What if one of them got into the garden? No one covered how I was to guide a bullock out. I do think they need to revise the guide dog curriculum. For now, I’m keeping a steady watch on these enormous creatures. I wonder if they’d benefit from collars and leads? It helps me to have clear expectations. They could have bells to indicate that they are on free time. I wonder if Fat Dog would agree to electrified fences? My next issue is much more delicate. Connie the Newfoundland doesn’t like me. I’ve no idea why, but she seems to think she is special to Fat Dog on Wheels. She is very disrespectful of my role as primary carer. We had a spat yesterday. I think it was a no score draw. She thinks she won. I beg to differ. For now I’m giving her space, but she needs to lighten up. Fat Dog is plenty big enough for us to both have quite a lot of her each. Funny, Tabitha isn’t bothered. She quite likes me. Humphrey says Fat Dog is his mum and that, for him, is that. I can’t quite work out what he sees in her, but they say love is blind. Probably why there’s a need for so many guide dogs.